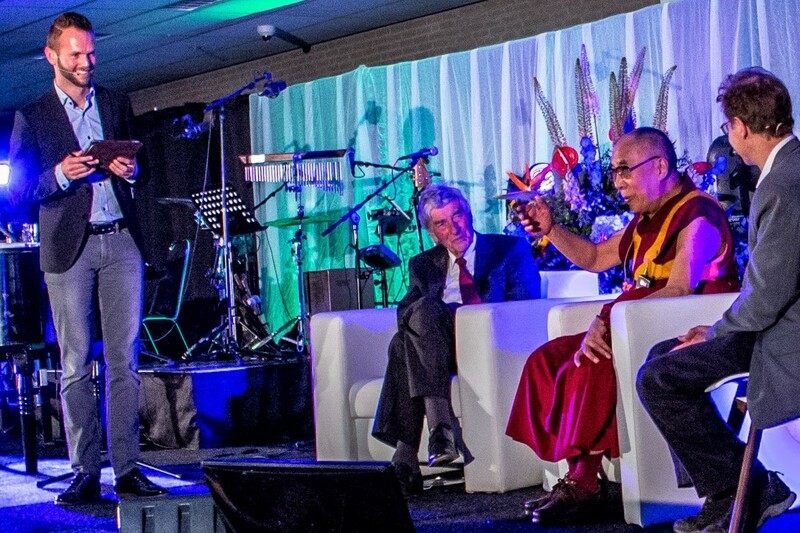 In spring 2014 His Holiness the Dalai Lama visited The Netherlands for a 2-day visit. The Global Leaders Academy organized “Education of the Heart” at the Erasmus University in Rotterdam. This conference was visited by about 500 educational professionals. Keynote speaker was the Dalai Lama and with the audience he shared his vision on how education these days ideally should look like. During his extensive speech attendees were raising many questions. Partly related to the subject, but as it goes with ‘celebrities’, attendees were curious about other things too. I had the privilege to interview him [and his friend and former Dutch Prime-Minister Ruud Lubbers], about how he looked at education worldwide. His answers proclaimed a system in which childeren are foremost trained on how to deal with social challenges, rather than only learn sec knowledge. Something he calls “education of the heart. On the question “What is your favorite memory about your childhood schoolperiod”, he answered “my holidays!”.